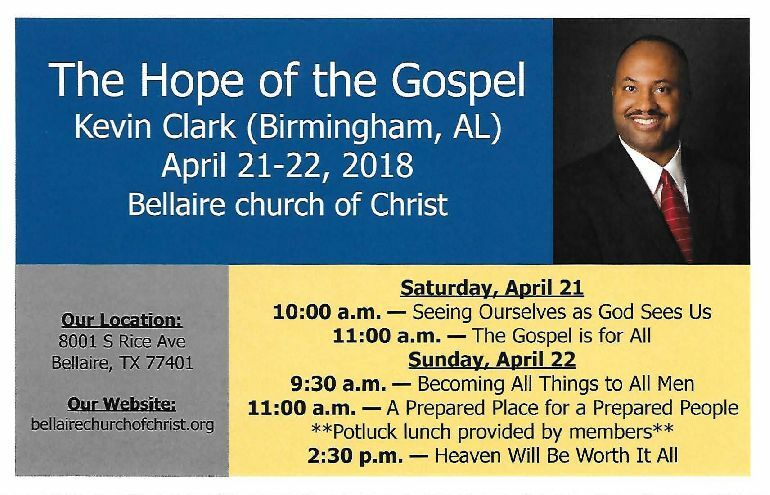 Kevin Clark, from Birmingham, AL, will be with us to present encouraging lessons from God's word. Here is the schedule: Saturday 10:00 a.m. "Seeing Ourselves as God Sees Us" Saturday 11:00 a.m. "The Gospel is For All" Come and join us! Saturday 10:00 a.m. "Seeing Ourselves as God Sees Us"
Saturday 11:00 a.m. "The Gospel is For All"
Sunday 9:30 a.m. "Becoming All Things to All Men"
Sunday 11:00 a.m. "A Prepared Place for a Prepared People"
Sunday 2:30 p.m. "Heaven Will Be Worth it All"